Army Experience Center Shut Down! 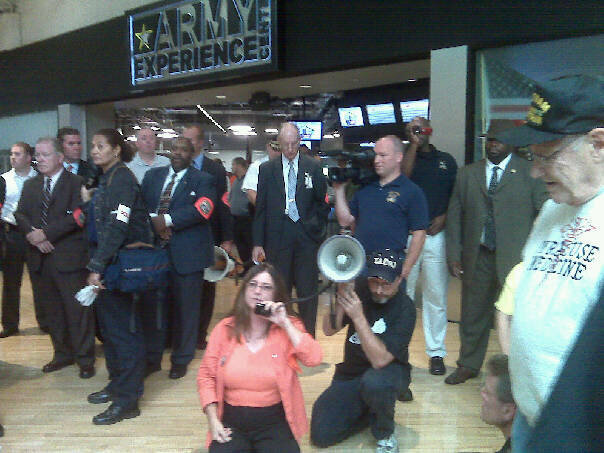 Seven people, including members of World Can't Wait, were arrested at a protest at the Army Experience Center (AEC) inside Pennsylvania’s Franklin Mills Mall today. The AEC has been the site of much controversy since before it opened. It is a pilot project in the government's pursuit of recruiting our young people into the military. The AEC is predatory in nature as it uses violent video games simulating war to attract young people into its doors. Despite all its glitzy gadgets and its claim that it provides an almost after school like program by helping kids with their homework it is no less a recruitment center. With two illegitimate occupations in Afghanistan and Iraq and with the escalation in Afghanistan, many are outraged by this new recruiting tool. Today 200 protesters marched to the mall and went inside to AEC’s entrance. They demanded that the AEC be shut down and intended to hand over a petition that stated this righteous demand. As they approached the AEC they were met by a row of police blocking the entrance to the recruiting center. Inside protesters could see the flag waving and finger flipping Gathering of Eagles, a reactionary and thug like group that tries to bully and intimidate activists of anti-war groups. The protesters, among them members of World Can't Wait, agitated out in front of the AEC, giving eloquent and compelling reasons why places like AEC should be shut down. At one point protesters sat down in front of the entrance and were then warned by police to get up and leave. After awhile the protesters got up one by one but began agitating all over again. They were warned again by police to leave or they would be arrested. Police began to corral people out of the mall, but a few members did not leave immediately and were arrested. In all seven were arrested. At this time they remain at a precinct in the area. World Can't Wait, which launched an anti-military recruitment campaign in the fall of 2008 called "We Are Not Your Soldiers," has been, among other groups, instrumental in bringing attention and focus to the AEC and the need for people to take a visible stand in opposing its presence and operation. They, along with other groups, have staged similar protests at the AEC before. They were determined to shut it down and save the lives of young American women and men as well as the lives of hundreds of thousands of others in the Middle East. They strongly believe that when the U.S. Empire's military can no longer prey on the youth it will no longer be able to wage illegitimate and immoral wars that cause untold suffering. This is the reason they have focused on this predatory pilot program by the military. Please stay tuned for further updates on this important story. Please also keep checking www.worldcantwait.org for updates on this story. Here you can also find out more about the "We Are Not Your Soldiers" campaign and how you can help bring the reality of what the U.S. military is all about to youth.